There was a time, not so long ago, when money was the only ingredient any candidate or political group needed to disseminate a political message to the masses. Billions of dollars have been spent producing and distributing political advertisements. To this day pundits and analysts gauge a candidate’s prospects for competing in an election by the amount of money that candidate can raise in order to buy media time. But all of this is changing rapidly thanks to social media. The economics of campaigning are being turned upside down by services like YouTube. We’re entering a new era of grassroots politics where an average citizens can produce and distribute political messages that reach a global audience instantaneously and at almost no cost. These new developments are fundamentally altering the balance of media power. At the same time, the widespread availability of these new tools raise some interesting questions about disclosure and transparency. We know the Obama Girl loves Barack, but we don’t have a clue who she is or what her motives are. From one perspective she’s helping the candidate gain exposure with a young demographic, but from another perspective she might be doing just as much harm to the candidate among voters who see the video as inane and frivolous — and depending on who produced the video, that may actually be the purpose. On television, viewers have some idea of who produced any given advertisement. The rules regarding traditional political ads require disclosure of the parties who finance political messages and disclaimers indicating whether or not a message has been endorsed by a candidate. What regulations, if any, govern the use of new media tools like web video, podcasts, blogs, social networks, and virtual worlds for the dissemination of political messages? The Internet’s reach effectively turns local elections into global campaigns. What level of foreign involvement is allowed in US elections? What rules apply when a grassroots campaign effort is adopted by an official campaign? Since I’m not a lawyer, or expert on federal election laws, I decided to seek advice from an experienced professional. As a result I’ve spent much of the last two week calling and emailing attorneys, trying to determine what rules apply to politically active netizens. My search lead me to Adam C. Bonin, a Philadelphia based attorney who participated in the FEC regulatory hearings which eventually lead to the passage of new laws governing online political activities. During those hearings Adam represented Markos Moulitsas, Matt Stoller, Atrios and other high profile political bloggers. If anyone knows about Federal Election laws as they apply to the Internet, it’s Adam. Adam explained that, as of March 2006, the FEC has essentially made broad exemptions for political speech online. As a result, individuals are free to use the range of social media tools at their disposal to organize grassroots campaign efforts with almost no oversight, disclosure, or reporting requirements. “Campaign finance law is supposed to regulate money. That’s the whole point. We want to stem the ability of money to influence how legislators operate. The nice thing about this technology is that it allows people to have influence over the electoral process without spending large sums of money. It allows people to get together across geographic distances for common goals, aggregate small dollar donations, and create political change that way. The new rules are neatly summarized and clearly explained by The Net Democracy Guide — a website run by the Center for Democracy and Technology. These new regulations allow individuals or groups to freely engage in a broad range of “uncompensated internet activities” which are now exempt from all campaign finance regulation. Adam explains that, during the FEC hearings, he and his team urged the Commission to think more broadly and to craft laws that covered a wide range of online activities, not just blogging. The good news for anyone using the Internet to participate in the political process is that nearly all activities are exempt from FEC regulations. However, while the regulations seem to cover the vast majority of political activities that may occur online, they don’t address all of the questions that I’ve raised. For example, the new rules don’t address the issue of foreign involvement in US campaigns. I asked Adam a few hypothetical questions based on some of the political activity I’ve witnessed in Second Life. For example, what if an amount being spent on a virtual campaign went beyond the “nominal” fees that are described in the new regulations? And what about the involvement of foreign nationals in these campaigns? Are they entitled to the same exemptions? And if not, what limitations apply? At one point Adam commented that my questions were making him dizzy. To be honest, he wasn’t the only person who told me that this past week. I walked Adam through several scenarios. While these scenarios are specific to activities currently taking place in Second Life, the issues addressed in each of these situations are relevant to grassroots campaign efforts on any other social media platform. I described the activities of the various groups campaigning on behalf of specific candidates in the virtual world. To date there are groups representing Clinton, Obama, Edwards, Gravel, and Paul. Only one of these groups (Gravel) has been authorized by the official campaign. The rest of the groups are the work of volunteers who share the common goal of seeing their candidate of choice elected President of the United States. Generally, the activities of these groups fall under the broad exemptions specified in the new FEC regulations. In fact, the unofficial groups are actually allowed to coordinate their efforts with the official campaigns, and to disseminate official campaign materials. I also presented Adam with a few scenarios related to the costs involved in hosting virtual campaign headquarters in Second Life. While it’s entirely possible to host a virtual building on the cheap in Second Life, it’s also possible to spend large sums of money on land and the corresponding land use fee. Adam indicated that monthly fees in $20 to $30 range would probably be considered reasonable, but monthly fees costing hundreds of dollars would definitely not be considered nominal. After evaluating the campaign locations of the virtual groups campaigning for John Edwards, Ron Paul, and Barack Obama, I determined that the land value and corresponding monthly land use fees were likely within the range of what the FEC would consider a nominal expense. The Gravel group, being part of the official campaign, are allowed to spend whatever they like, but are subject to the same regulations the official campaign would be subject to in real life. The Clinton group’s headquarters seems to be the exception. The group’s building is hosted on a dedicated island and the size of the land is much larger than any of the other grassroots groups. Dedicated islands in Second Life are not cheap, and the corresponding land use fees are considerable as well. 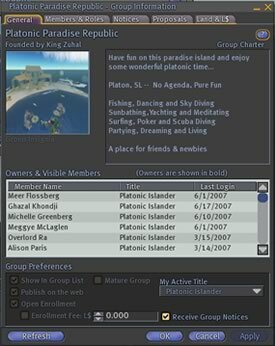 Linden Lab currently sells islands for approximately $1,675 US, and the monthly land use fee for an island is $295 US. After presenting Adam with this scenario he indicated that the amounts in question would probably not be considered nominal and would likely elevate the display to a different level — one requiring full disclosure and disclaimers. In Second Life full disclosure would likely be implemented in the form of a sign, prominently placed, identifying the person who paid for the build (by real world name), and listing the permanent street address, telephone number, or world wide web address of that person. After further review, however, I determined that the Clinton island is part of a special “low performance” region where full islands are available at a significant discount. My research indicates the cost of the island was probably in the range of $400 US, and the monthly land use fees are $80 US. While those amounts are still quite a bit more than the other grassroots groups are spending, they could fall within the range of what is considered nominal. Since the FEC regulations don’t specifically indicate what amounts are considered to be nominal, this is all open to interpretation. The point that anyone involved in campaigning in Second Life should probably take away from this is that, while these activities are protected by law, there could be a point at which some line can be crossed. 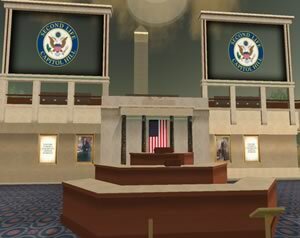 For example, if a group were to come into Second Life and build a custom island in the shape of John McCain’s head, then setup a grassroots campaign headquarters there, the expenses involved would likely be deemed to be beyond what would be considered an “uncompensated internet activity”. Given the fact that US residents are a minority in Second Life, we can expect that there might be a considerable number of foreign nationals participating in these groups. Depending on who you talk to, this involvement is a touchy subject in Second Life. I spoke with at least one group steering committee member who believed that foreign involvement was OK as long as the group was unofficial. The truth of the matter is that foreign involvement in US campaigns is not a problem, as long as the foreign national is acting in a voluntary capacity. Foreign nationals can even participate in fundraising efforts on behalf of US candidates. What they can’t do is receive compensation for their activities, or contribute anything of value. Foreign nationals can also be used as vendors, but they must be paid their full fee. Any discount would be considered a contribution. The first Gravel campaign HQ was built by Cezary Fish, a Polish national. If Cezary was not paid his regular fee for construction and hosting of this building then his efforts would likely be considered a contribution. Since the Gravel group abandoned the location almost immediately after it opened, it seems unlikely that this will ever become a formal issue. The law regarding contributions from foreign nationals requires that a campaign return the donation immediately upon receipt — which is more or less what the Gravel group did. Also, the campaign maintains that Cezary was paid his full fee. In which case, there would be no violation. Clinton Island is located in a region called Platon. While the island has been deeded to the Clinton 08 Steering Committee, that region was previously owned by King Zuhal, the founder of the Clinton group. King is also believed to be a British citizen. Before deeding the island to the Clinton group, King ran it as Platonic Paradise Republic. In fact, photos of the island as it was before the Clinton group took over are still visible in the Platonic Paradise group listing. It’s clearly the same island, and even the same building. While the costs associated with the low performance island may not set off alarms, the fact that the island has been deeded to the group by a foreign national certainly will. Clearly, the island is a thing of value. The fact that the group is not “official” does not exempt them from these restriction on foreign contributions. The group is clearly calling for the election of a specific candidate to a federal office. As a result, they can’t take any form of contribution from a foreign resident. See the FEC website for a more detailed discussion on the laws regulating the activities of foreign nationals in US elections. The Second Choices blog raised the issue of corporate branding at the first Gravel location. I took this issue up with Adam and he believed that it likely would not be a problem as long as Cezary’s “aHead Corporation” was not a real corporation. I have to admit that I haven’t delved into the corporate structure of Cezary’s business. Call me a slacker, but this story is complicated enough as it is, and besides, the first Gravel location has already been abandoned. As I’ve noted, most of the political groups in Second Life seem to be operating well within the boundaries of the law. That’s not very hard to do considering how much freedom the new FEC regulations have given individuals and grassroots organizations. In the case of the Clinton group, it does appear that they’ll need to make some effort to address the donation of land by a foreign national. If that’s already been done they should definitely make an effort to be more transparent about their activities. For everyone else, my best advice would be to keep your build’s reasonably sized, and don’t take anything of value from non-US citizens. Until next time, I’m Ronin Kurosawa and I approved this message. Nice work – about time someone actually did the legwork required to write an intelligent synopsis of what’s going on. This was factual, well written, and well researched, a refreshing change of pace after reading other “writers” who’ve blogged about this issue. Their blog was poorly written, full of errors, unresearched, and was more of a personal vendetta than a factual piece. It’s refreshing to read a blog that isn’t being used as a personal soapbox to bash those the writer doesn’t like and provide flattering, yet unfactual information about those the writer does like. Well, it’s a good place to start…NOW!